Munich’s day-care centers struggle to meet the demand for child care in the city. LMU does much to remedy this situation by creating family-friendly working conditions for its staff members and students. Full-time child care, child care on call, flexible short-term nursery care, back-up care. The diversity of these terms alone underlines how seriously LMU takes the issue of providing family-friendly working conditions for its students and staff. This concern is also a reflection of the growing pressure on child-care facilities in Munich as a whole. “LMU is of course directly affected by the imbalance between supply and demand in the area of child care in the city,” says Margit Weber, the University’s Women’s Representative. “And this makes it more difficult for the University to find solutions for its employees and students than it is for universities elsewhere.” LMU’s size doesn’t help either: more than 13 per cent of its approximately 50,000 students have at least one child to look after. Furthermore, the variations in the work schedules of staff employed in different Faculties and the irregular hours that characterize students’ workdays mean that the demand for child care varies widely even within the institution. In cooperation with other agencies, in particular the Studentenwerk München, LMU strives to meet the diversity of demands by offering as much choice and flexibility as possible. 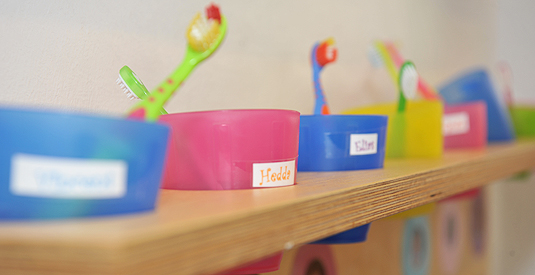 Its two creches and the day-care center in Martinsried, provide both half-day and full-time supervision. If parents just want to “park” their children for a short time, while they attend a lecture for example, the “Campus Kids” will take on the job. In addition, since 2010 the children of staff members can also enjoy the varied holiday activities offered by LMU’s in-house child care services during vacation time. Given the problematic position with respect to child-care facilities in Munich generally, self-help and self-organization can work wonders. To catalyze such initiatives the Student mit Kind (Student and Child) team at LMU offers parents and expectant mothers opportunities to form networks, talk about their experiences and pool know-how. Moreover, beginning in the coming winter semester, the Student Advisory Service plans to organize playgroups, coffee-shops with play areas, and family breakfasts. Here the idea is to bring students with children together to compare notes and stimulate the exchange of information, as a complement to the guidance offered by the Student Advisory Service. Apart from the basic problem of finding long- and short-term child care, working parents are, of course, continually confronted with ostensibly minor predicaments - Jill needs to be fed, I have to change Jack’s nappy, where do I go? Where can I put the pram during the lecture? LMU also provides ready answers for these everyday dilemmas, having provided a large number of conveniently sited nursing rooms and changing areas over the past few years. Naturally, LMU cannot provide on-campus solutions to every problem from its own limited resources. What it can do instead is to inform and advise parents, and direct them to outside agencies that offer reliable child care. In this respect also, LMU has played a pioneering role. In 2008, LMU was the first university in Bavaria to conclude a formal cooperation agreement with an external provider of family services. Since then, staff members can make use of the advisory and referral facilities offered by the firm PME Family Services – free of charge. The costs are borne by LMU. And LMU also bears the cost of back-up child care in PME’s facilities when regular on-site day-care services are unavailable. Parents – and not only single parents, who must often bear the brunt of child-rearing on their own – consult the Advisory Service on issues extending from financial through course-related to personal concerns. Couples increasingly avail themselves of these services to learn in advance how LMU caters for students with children. “This suggests that, in future, we will have to pay even more attention to the designing courses that are compatible with the exigencies of family life,” says Adam. In addition to the Student Advisory Services, students and staff can get in touch with LMU’s Women’s Representative, and the Studentenwerk also dispenses advice on social services. Child care is one of those areas where one can never do too much. “All in all, one has to say that LMU invests lots of money and – given its size – does a great deal for staff and students with children,” says Women’s Representative Margit Weber. For more information visit the link list in the German Article.